Use this Chinese lantern craft activity as part a preschool theme study about China or at Chinese New Year. On the 15th of the first month of the Chinese New Year, the Lantern Festival or Yuanxiao Jie, a traditional Chinese festival, is celebrated marking the end of the celebrations of the Chinese New Year. During this festival people flock to the streets with a variety of lanterns under the full moon, watching lions or dragon dancing, playing Chinese riddles and games, and lighting up firecrackers in an vibrant colourful display. The Chinese New Year festivities traditionally start on the first day of the lunar month and continue until the fifteenth, when the moon is brightest. Enjoy this preschool Chinese theme. 1. Fold the card in half lengthwise. 2. Starting at the folded side, draw pencil lines across it, not all the way across, on which to cut. Make sure the lines are equal in length and evenly spaced. 3. Cut along the lines carefully. 5. Take the top and botton ends of the card, overlap them and paste them together to make a cylinder. 6. Cut a strip of paper and attach it to make the handle. 7. If you make more than one lantern, hand them on a string across the room. 1. Decorate the card with crayons, glitter, sequins, etc before making the lantern. 2. Alternatively, paste cellophane paper onto the inside of the card after cutting the slits. This will create a colourful effect when the sun shines on the lanterns. In addition to this Chinese lantern craft, you might also enjoy All About Ping Lapbook which is based on The Story About Ping by Marjorie Flack and Kurt Wiese. This lapbook is suited for children 5-8 years. 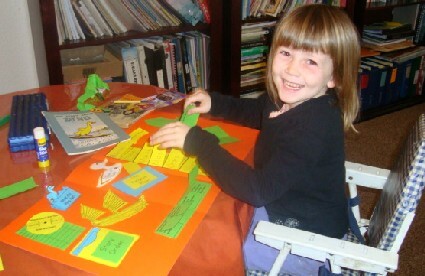 Younger children can also join in, but will need more help with the cutting out activities. It includes 18 different activities that focus on China, the Yangtze River, ducks, boats, compass directions, vocabulary and more! Let your children experience the textures of different mediums and practice fine motor skills, like cutting and pasting. Tearing is also a good activity for developing fine motor skills. Get easy crafts for kids submitted by visitors to this site.